The aldosterone kit is designed for the accurate quantitative measurement of the Aldosterone steroid hormone released by cells. The Aldosterone assay kit accurately measures the release of the Aldosterone steroid hormone in cell supernatant and serum samples. Aldosterone is a steroid hormone synthesized from cholesterol in the adrenal cortex. Aldosterone is metabolized in the kidney and liver, and functions as the key mineralocorticoid in the control of sodium and potassium balance. 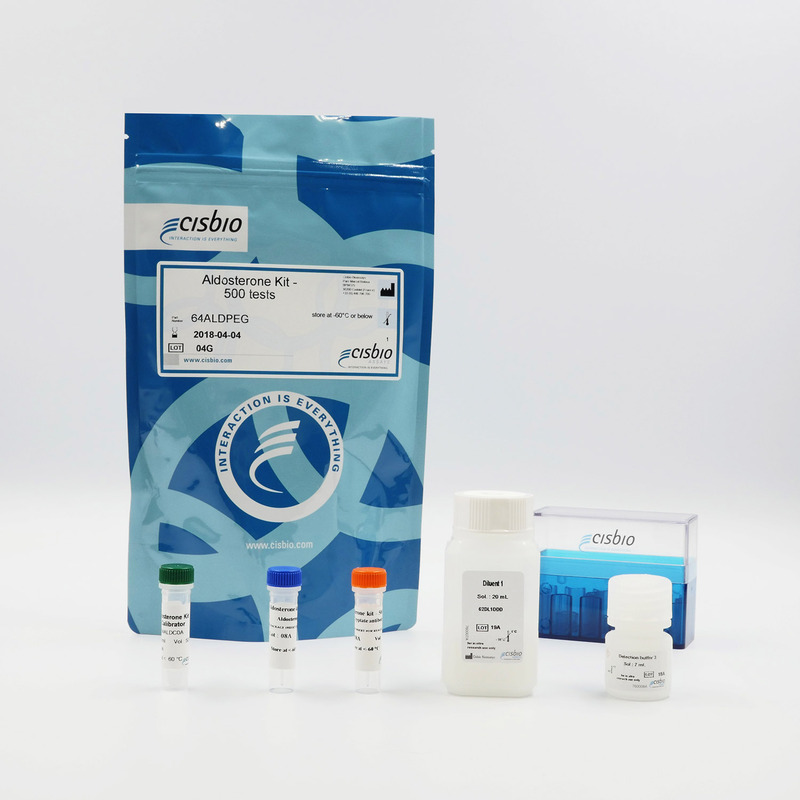 The Aldosterone kit offers superior benefits over traditional ELISA readouts with the ease of an Add & Read process coupled with the robustness and sensitivity of homogeneous TR-FRET assays. The kit is based on a competitive format involving a specific antibody labelled with Cryptate (donor) and Aldosterone coupled to XL665 (acceptor). Aldosterone produced by cells competes with XL665-labelled Aldosterone for binding to monoclonal anti-Aldosterone Eu Cryptate. The Aldosterone assay features a streamlined protocol with only two incubation steps: - Cell stimulation by target compounds - Aldosterone detection using HTRF reagents This protocol requires only a single, one-hour incubation period following cell stimulation.